A picture is worth 1,000 words and as far as I’m concerned, I could talk about the works of Norman Rockwell all day! I love his work: his ability to capture reality, innocence, truth, humor and the overall American spirit. This year, I’ve been reaching into my collection of Norman Rockwell prints (most in the form of old calendars) and showcasing a select few each month or season. He has a collection of paintings that fit with Thanksgiving, winter, and love (for Valentine’s Day) and even some for football and baseball season. As I was looking through my pile of his works, I came across some interesting resources to turn to during Black History month which I would like to share with you today. There are only a handful of these, but they can spark some interesting conversation as they already have in my own classroom. This is an innocent enough painting to display in your classroom. A young boy fidgets in his wallet to pay a bill as a waiter looks on with a smile. Drawing conclusions about what each character is doing and thinking is a fun activity to use in the classroom. A sign of the times, for sure and probably a brave statement from Norman Rockwell, these new kids are moving into the neighborhood and, well, it’s interesting to ponder what the white kids are thinking. A great lesson in point of view, acceptance and friendship lay in this image for today’s children. 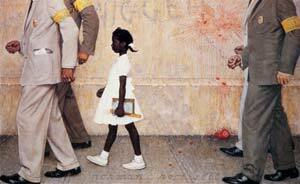 I guess I took a bit of a risk showing the painting of Ruby Bridges to my students. 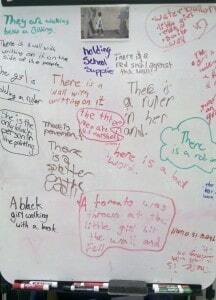 While some were fixated on the tomato splattered on the wall and ground, others noticed the “very bad word” on the wall. But I was glad I did show it to them. This led to some great discussion about ignorance, tolerance and bravery. Yes, this too is a Norman Rockwell. 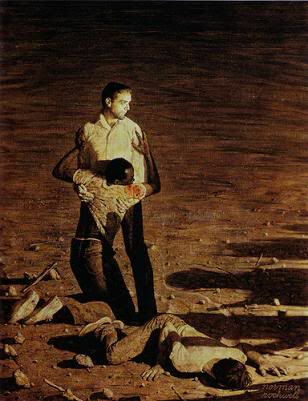 It’s interesting to note that when Rockwell was employed by the Saturday Evening Post (from 1916-1963), he was not allowed to depict blacks in a form other than in a subservient role. 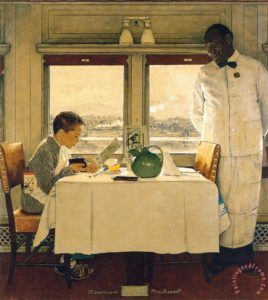 Rockwell eventually quit his job and took employment elsewhere so that he could have more artistic freedom to express the times. I did not, nor do I plan to use this particular painting with my fourth graders, however, it is a powerful image and may fit the age appropriateness of yours. For more in-depth analysis on these paintings, please see this post where an artist can speak far better than I on each painting. 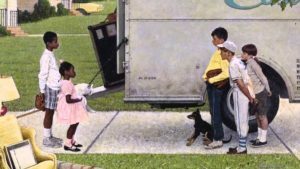 Another very interesting post I came across was one called “Contrasting Views on Norman Rockwell.” It is an interesting look at varying viewpoints on many of his paintings including the ones above. Although I will not go into my own interpretations of each painting, I can tell you how I have started to use these illustrations in my classroom to elicit discussion around Civil Rights (which of course we started with last month for Martin Luther King Jr. Day) and black history. Just yesterday I pulled out a couple of images and asked students, without explaining anything about the paintings to them yet, to simply and carefully observe, sharing statements of observation only. 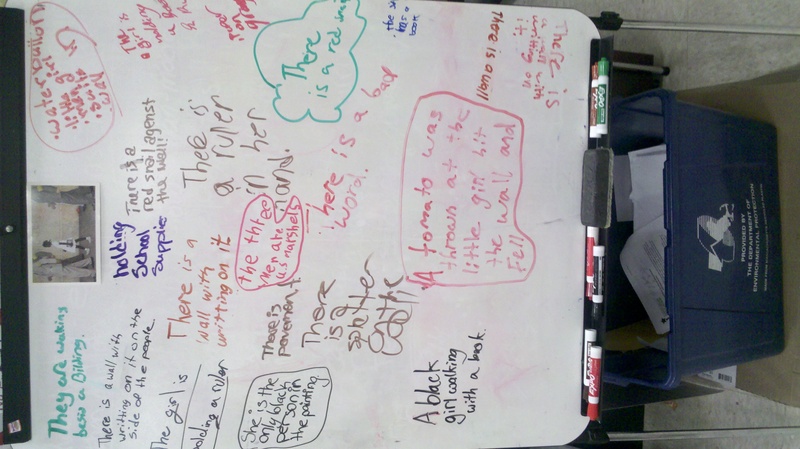 They then wrote down their observations on a white board in the classroom. From here, we will discuss further and start to draw conclusions about the images. My plan is to share my interpretations as well as give some history to each painting. My students are already hooked on the images I have shared with them. 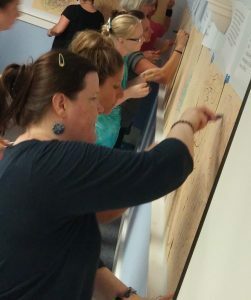 It’s exciting to watch them try to understand more of our American history through the eyes of art. What a powerful medium to use. I encourage you to try this in your own classrooms and let me know how it goes. BIRTHDAY ALERT – Norman Rockwell’s birthday is on February 3rd! To celebrate this great man, check out my ebook, Integrating the Works of Norman Rockwell into Reading Instruction. 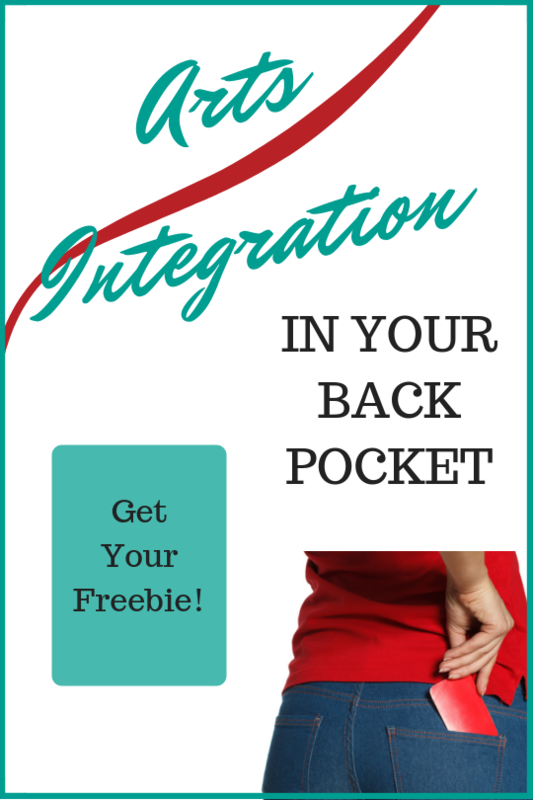 Go – Get your copy today! There is so much you can do with a Norman Rockwell painting (or other well-selected painting or photo) that directly relates to many reading skills. 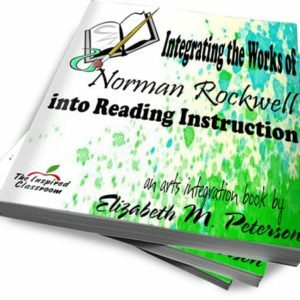 My ebook, Integrating the Works of Norman Rockwell into Reading Instruction explains more and gives activities to teach many of them including drawing conclusions, deciphering fact and opinion and making predictions.